More in the news this week about Indian cotton farmers killing themselves. Mainly cotton farmers. Mostly deep in debt. According to others, Indian cotton farmers have been saved by Bt and are now buying tractors and sending their kids abroad to school. Bt cotton contains a gene from a bacterium that produces an insecticide against some caterpillars that are serious cotton pests. Whether you believe it is a killer or a savior in India probably depends on who you hang out with. Most of what is said on the issue spreads through highly polarized agenda-driven information networks. 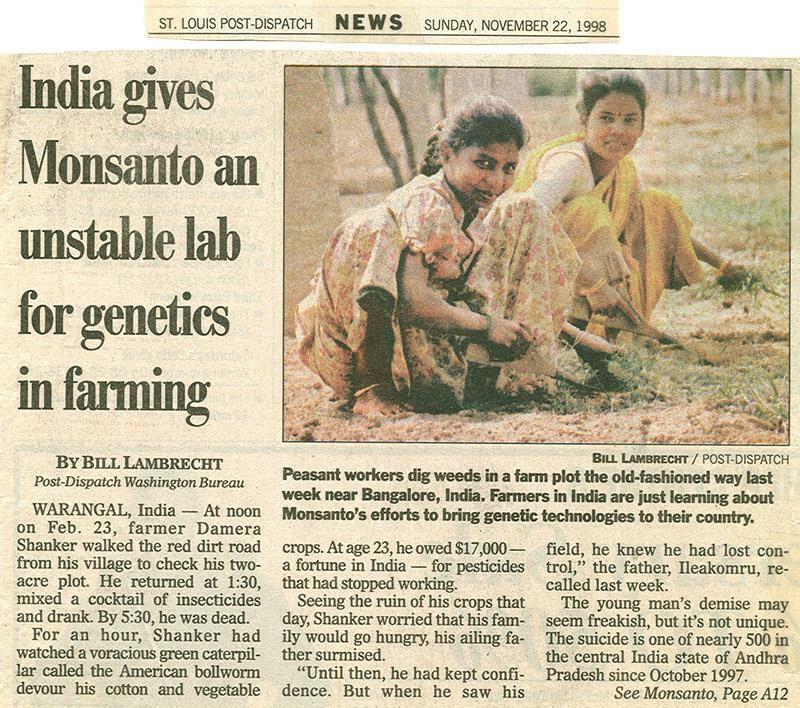 I have spent the last 10 years doing research among Indian cotton farmers, and if I were to say my findings showed Bt seed to be a killer, it would be picked up by the enviromentalist, liberal, crunchy, anti-corporate, and European information channels. On the other hand, if I said my findings show Bt seed to be saving Indian farmers from ruin, it would be picked up by a lavishly funded network of industry and cat’s paw websites, as well as by some highly partisan academics who have long ago left behind any pretense of scientific objectivity. Actually what I have learned about GM seeds and farmer suicide doesn’t fit either platform. That means it’s unlikely to be propagated through either network, and you are unlikely to be reading this right now. But if you were reading it, you would find out that both claims are false. Let’s look at each claim. Bt cotton appeared in 2002. Before that, a box of seed cost 400 rupees (about $10.) Cotton farmers usually buy 1-3 boxes of seed. At first, Bt seed cost $40/box but they were forced to lower it; it has usually cost $19 in recent years. Some economists point out that farmers’ pesticide bill usually drops when they buy Bt seed, which I found as well. But also consider the larger context. I surveyed cotton farmers a few years ago and found the median debt to be $375. Farmers definitely feel the extra $9/box, but it’s a bit of a stretch to see this as a crippling addition to their debt. There’s nothing about Bt that makes a cotton plant need more water. In the beginning, Monsanto/Mahyco started by putting the trait into existing hybrid seeds, some of which were water-intensive. But soon there were dozens, and now hundreds, of Bt hybrids on the market, with varying water requirements. Adapted from G. D. Stone 2011 Field vs. Farm in Warangal: Bt Cotton, Higher Yields, and larger Questions. World Development 39(3):387-398. Look at the AP line in the chart and consider that Bt cotton wasn’t even adopted on a significant scale until 2005. There’s a ten year surge in cotton yields, and six years of it happened before Bt started to spread. Ag hands can ponder the various factors affecting these trends, but one thing is for sure: most of the cotton boom cannot be attributed to Bt seed. In fact Bt seed also appears to be exacerbating a key problem underlying the suicides: technology treadmills. Technology treadmills can have disastrous effects on farm management. 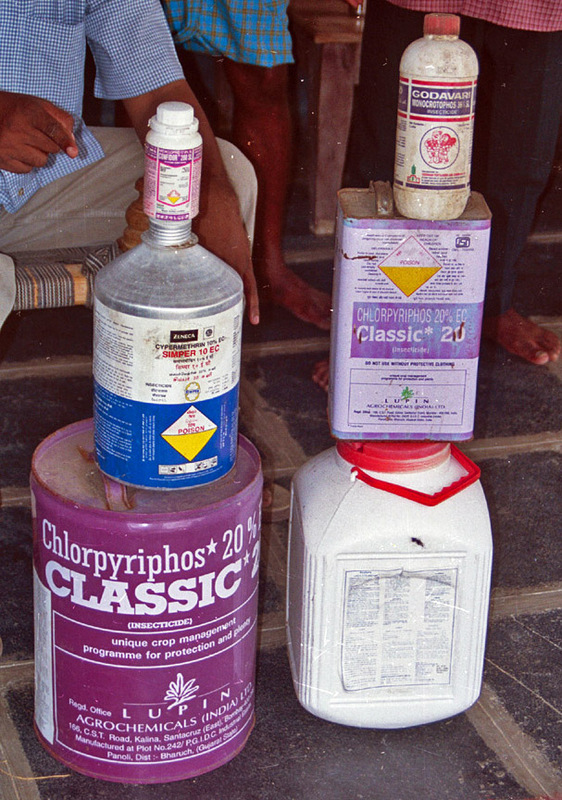 I saw how badly farmers were trapped on the pesticide treadmill the first time set foot in Warangal in 2000: they kept asking me if I had, or knew of, a “new pesticide” because the insects had developed resistance to the last pesticide. In a bit of gallows humor, a group of farmers built a mountain of empty cans from the pesticides they had gone through (including chlorpyrifos, subject of a previous blog). Even worse was the “seeds treadmill,” with literally hundreds of hybrid seed brands appearing and disappearing on the stores, and the normal process of farmer evaluation breaking down. The seed and spray treadmills are slightly different, but both have viscious effects on local ecology, on farm economy, and on the farmer decision-making. And then, for a coup de grâce, they destroy the farmer’s confidence that he’ll ever dig his way out. Bt cotton has been generally effective in warding off caterpillars. It has not “failed” and has not run up farmer debts, no matter what the network of anti-GMO sources say. But it has now snagged farmers on a genetic technology treadmill. By 2009 there were 5 different Bt gene combinations going into 284 separate Bt hybrids. Before anyone figures out how these seeds function, they will be replaced. Now populations of the non-target pests are starting to explode, and biotech companies are working on new genes as a solution for that problem. But for Indian cotton farmers, the “solution” is the problem. This entry was posted in Agriculture, Biotechnology, India and tagged biotechnology, bt botton, cotton, genetically modified, india, suicide. Bookmark the permalink. a. Is Bt either a necessary or a sufficient explanation for increased cotton productivity? b. Have Bt succeeded in decreasing pest infestation in cotton to indirectly boost productivity and consequently bring about reduction in pesticide expenses? Well despite what you said about not reading it, I DID read it and it was the first even-handed discussion of the India suicide problem that I have seen. Great work.